Reverse description: 'trophy' on triangular base, 'S' motif to each side, flanked by cross-hatched 'box' motifs. 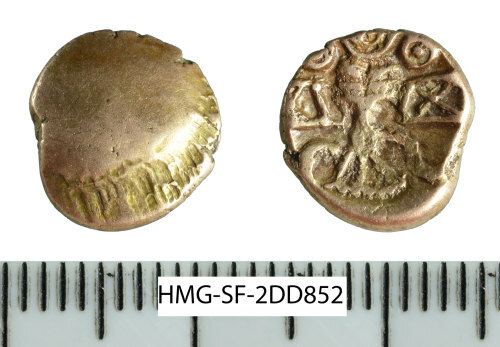 British Iron Age Eastern uninscribed gold quarter stater, c. 50-20 BC. Chris Rudd's "Little Horned Serpent" type ABC 2225 (VA - BMC - ). A gold uninscribed (South Eastern LZ) Kentish Iron Age quarter stater (attributed to the Cantii), c. 50-20 BC. BMC Hobbs 2469-71; Rudd ABC 198.